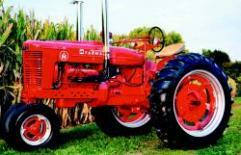 When is an IH Farmall M not an IH Farmall M? When it belongs to Mark Bennett of Hamburg, Michigan! Michigan can get pretty cold in November and it can give a person a bit of cabin fever. In November of 2012 while looking for something to do indoors over the long winter, Mark spotted a 1950 IH Farmall on E-Bay, and he knew right away this would be his winter project. Mark is an antique tractor collector - restorer, but had an urge to do something different with his next restoration. He may have purchased the M from his living room, but he had to drive 150 miles during a Michigan winter to bring it home. Mark loaded the M on his twenty-five-foot flatbed trailer and hauled it home with his pickup. With the help of his father Dale Bennett, cousin Sam Richter, and Skip’s Repair, the project was off and running. Sam repairs tractors for a living, so he was able to take the lead on this project and make it all work. Mark said, “Sam was the brains behind this project; without him we may never have gotten it off the ground!” The grille, hood, fenders, rims, and seat were sandblasted. The remainder of the chassis was sanded and wire brushed until all traces of the old paint and rust were gone. The parts were then repainted Farmall red. Over the next four months the men worked on the M, rebuilding the stock transmission and the replacement engine. Mark said there was plenty of interest in the project from his friends who stopped by to chat and check on the progress. You see, the engine the guys were rebuilding for the M was a 1973 International 392 V-8. They carefully thought through what modifications they would have to make to be sure everything worked the way it should. Mark said this project was completed “with lots of thinking and beer drinking.” The engine was completely torn down, rebuilt and dropped into the frame of the M. He has seen other cases when someone has placed a different engine into a tractor where workmanship and attention to detail were lacking; and it was not a pretty sight. Handmade mounting brackets and linkage have to be made to look professional or they can produce a less than desirable effect that can ruin the entire project. Even judges agree that the customized effect of the M is award winning- Mark took home the Best Tractor Award from a tractor show in Hamburg, Michigan, in August of 2013. Not only does the M look good, but it can pull as well. Mark and the M took home first, second, and third place awards from a tractor pull in June of 2013 in Dexter, Michigan. Mark’s other antique IH tractors are not quite as unique as the oneof- a-kind M, but are just as carefully restored. They consist of a F-20, Farmall A, BN, M, H, 300 and T6 Dozer. Mark plans to take the M to more events now that he is semi-retired. If you are at a tractor show in the Hamburg, Michigan area, you may run into this hot tractor that was designed and built during a cold winter.